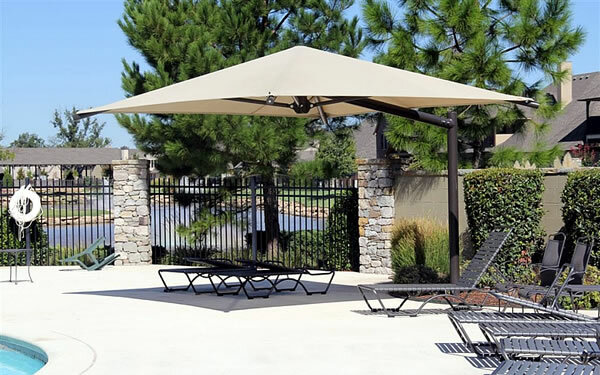 Umbrella cantilever shades offer sun protection with no obstructions underneath the canopy. 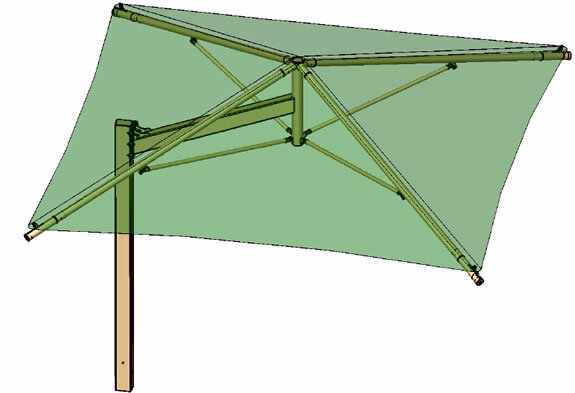 Instead, the canopy is supported by a single post located outside the shaded area. Cantilevered umbrellas provide sun protection without obstruction from a vertical posts in the middle of the canopy, like traditional umbrella shades. This attractive cantilever umbrella shade is suspended from a single overhead post. 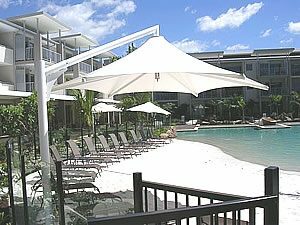 We offer umbrella cantilever shades with 1 or 2 canopies. The smaller single-post models have a single vertical post that reaches the top of the canopy and suspends it from above. The larger single-post models have a thick vertical post that branches under the edge of the canopy and supports its structure. Dual-canopy cantilever umbrellas have one main post with two angled posts branching off it higher up (see photo of Dual Cantilever Umbrella in the slideshow at the top of this page). Umbrella canopies with cantilever posts are available in square, hexagon (6-sided), or even octagon (8-sided) models. 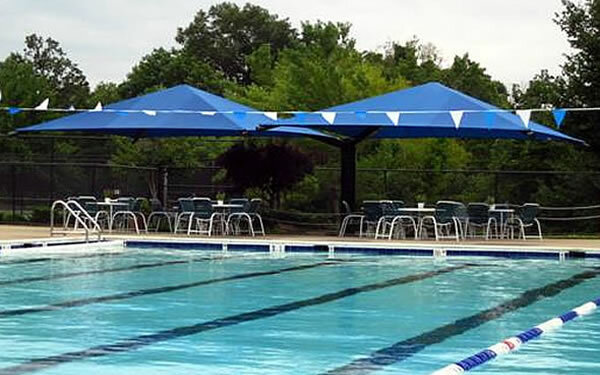 Square umbrella canopies are available in 10′ x 10′, 12′ x 12′, 14′ x 14′, 16′ x 16′, 18′ x 18′, and 20′ x 20′, 22′ x 22′, and 24′, x 24′. Hexagon and octagon umbrella canopies are available with sizes of the following length: 10′, 12′, 14′, 18′, and 20′. The larger canopies are supported by correspondingly thick, sturdy posts. The height of a cantilever shade is the height of the outside edge above ground level. The lowest height we offer is 8 feet, which is actually 11 or 12 feet high up in the center of the canopy. We also offer 10 feet, 12 feet, and 14 feet high cantilever shades as standard models. We can design cantilevers that are even higher, but these are custom jobs. Many colors available. Please see diagram on this page. 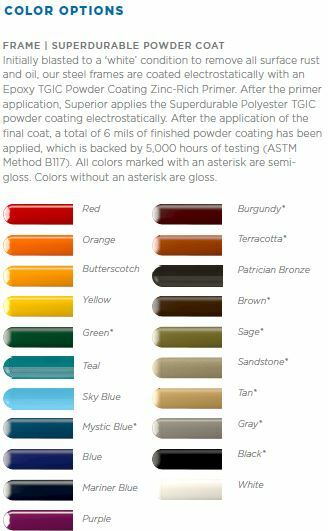 Pricing for umbrella cantilever shades — please phone us today. please phone us toll-free or contact us today.